One in 12 Americans Have Asthma. Every year, the number of people suffering from asthma grows. It’s estimated that one in 12 Americans has asthma, compared to one in 14 people who had asthma just a decade ago. The increased prevalence also takes a toll on the healthcare system: each person with asthma costs the U.S. healthcare system about $3,300 in medical expenses, missed work, and premature death. Unfortunately, about 250,000 people worldwide are dying from asthma—deaths that are avoidable, according to health experts, considering some of the causes of asthma—such as poor working conditions with exposure to fumes and excessive dust. There are a number of different treatments for asthma—the most popular one being an inhaler, which makes the asthma sufferer inhale corticosteroids to treat the asthmatic symptoms. But that treatment comes along with a host of problems, like figuring out the correct dosage and how often people should be using their inhalers. That’s why researchers are hoping a new, non-invasive technique will help solve these problems. 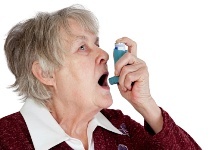 This treatment for asthma is a non-invasive breathing test called fractional exhaled nitric oxide and it measures airway inflammation—one of the main reasons why asthma sufferers experience many unfortunate symptoms—so that there’s less guesswork involved and doctors can determine the correct dosage amount and frequency of corticosteroid inhalation. For some patients, using an inhaler will be a life-saving measure, but this treatment for asthma will allow patients to determine their correct dosages, minimize the side-effects, and live a healthier life. Bass, P. “What are the common inhaled corticosteroid side effects,” About Asthma web site, September 13, 2009; http://asthma.about.com/od/treatmentoptions/a/ics_se.htm, last accessed April 15, 2013. “Asthma statistics,” American Academy of Allergy Asthma & Immunology web site; http://www.aaaai.org/about-the-aaaai/newsroom/asthma-statistics.aspx, last accessed April 15, 2013. Staples, G., “Asthma test helps doctor tailor treatment,” Chicago Tribune web site, April 10, 2013; http://www.chicagotribune.com/health/sc-health-0410-asthma-test-20130410,0,2458117.story, last accessed April 15, 2013.